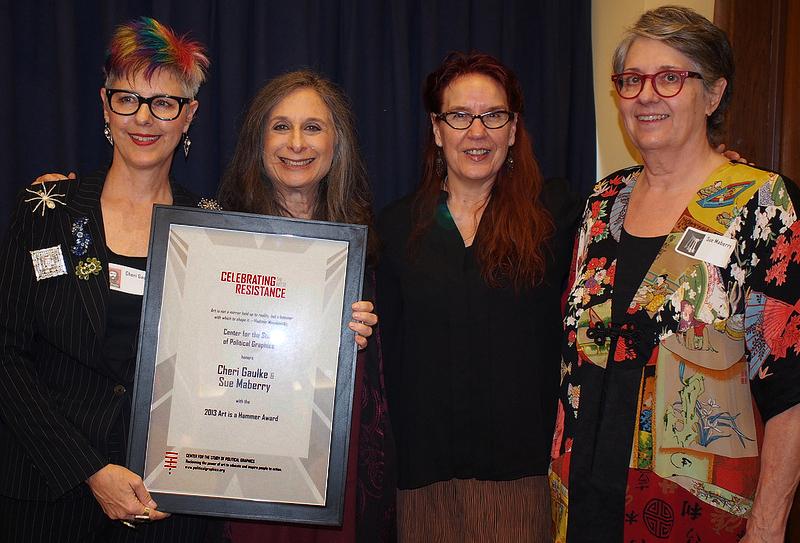 We were delighted to receive the Art is a Hammer Award from the Center for the Study of Political Graphics on October 20, 2013. The ceremony took place at an event called Celebrating the Art of Resistance at the Professional Musicians Union, Local 47 in Hollywood, California. The award’s name was inspired by this quote: “Art is not a mirror held up to reality, but a hammer with which to shape it,” by Vladimir Mayakovsky. Curiously, the same quote has also been attributed to Bertolt Brecht. Writer Terry Wolverton presented us with the award. The event was a wonderful gathering of activists and artists and it included a silent auction of a vast array of political posters. We purchased two: Sheila de Bretteville’s Pink poster and one with the Art is a Hammer quote (attributed to Brecht) by design firm Helvetica Jones. At the end of this blog post you can read the biographical notes that were in the program as well as our acceptance speech. We were thrilled to have so many dear friends and collaborators in the audience and grateful to our employers, Harvard-Westlake School and Otis College of Art and Design, for their support of the event. The CSPG is a wonderful organization doing fantastic work by preserving and archiving political posters in which artists contribute so greatly to social movements. On September 7, 2013, we attended the awards ceremony at the Women and Media Conference put on by the Veteran Feminists of America, We were there to celebrate Joannie Parker, long-time feminist activist and former head of Women’s Studies at Westlake School for Girls, now Harvard-Westlake School. The event was organized by another former colleague Martha Wheelock. 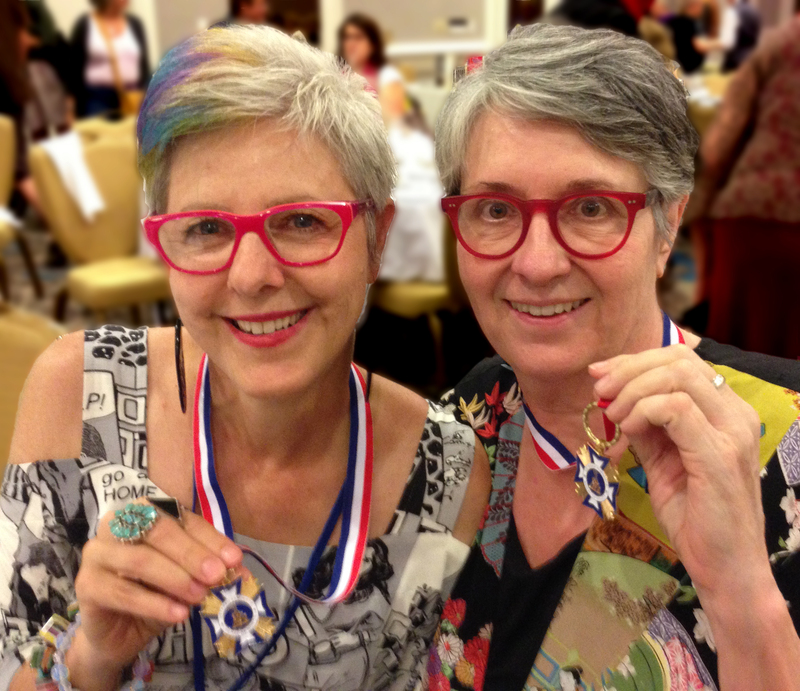 We were surprised when we were given medals for our work in the arts and at the Woman’s Building. 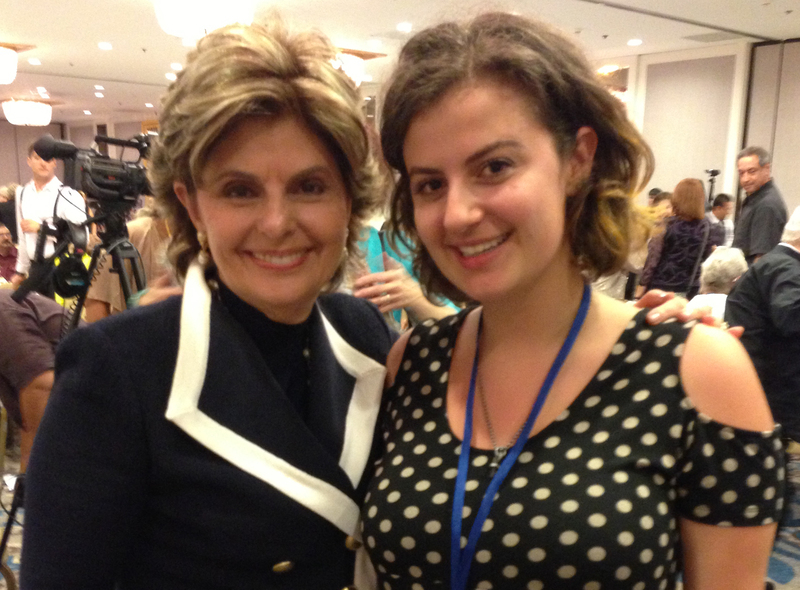 Our daughter Xochi was thrilled to meet famous civil rights attorney Gloria Allred. 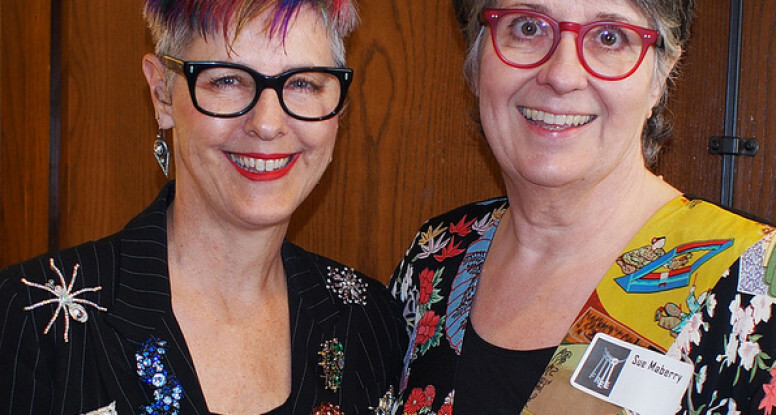 Cheri Gaulke and Sue Maberry met at the Woman’s Building, a feminist art center, in 1977 and have been a couple since 1979. They have worked individually and collaboratively as artists, activists and educators. At the Woman’s Building they often collaborated on programming and graphic design projects. They conceived the media event to hoist Kate Millet’s gigantic Naked Lady sculpture to the roof, which made the front page of the Los Angeles Times. In 1981, they cofounded Sisters Of Survival, an anti-nuclear performance group who wore nun’s habits in the spectrum of the rainbow, and used public performance and graphic design to network with artists and activists in North America and Western Europe. Gaulke and Maberry have also collaborated with their daughters, Marka and Xochi, on artworks about lesbian family. Maberry was a program director both at the Woman’s Building and at the Armory Center for the Arts. After receiving a Masters in Library Science, Maberry became Director of the Library at Otis College of Art and Design in 1992. There she has led efforts to incorporate the use of new and developing web technologies within the college. She received a grant from the Getty in 2000 to begin digitizing the Woman’s Building archive and make an image bank available online. She then created the TLC (Teaching Learning Center) to assist and train faculty in the use of technology in the curriculum. The TLC received a Center of Excellence Award from New Media Consortium in 2007 for their groundbreaking work in instructional technology. She has continued to make visible the history of the Woman’s Building as co-curator of a Getty-sponsored Pacific Standard Time exhibition at Otis College in 2011-12 that included the publication of two catalogs, video oral histories, and extensive online resources. As an artist, Gaulke brings a feminist perspective to a variety of issues working in such media as video, performance, artists’ books, and public art. She cofounded performance group Feminist Art Workers in 1976. She made a video with LGBT teens, designed the first U.S. memorial to Filipino WWII veterans, and created environmental video installations such as LA River Project with teens from East LA. She has completed ten permanent public art works including the Lincoln Heights/Cypress Park Metro Station that celebrates the role of water in Los Angeles. Gaulke has received grants from the National Endowment for the Arts, California Arts Council, California Community Foundation and LA’s Cultural Affairs Department. In 2011-12, her work was featured in Pacific Standard Time exhibitions at LACE and Otis. At Harvard-Westlake School, Gaulke has facilitated students to create award-winning videos as teacher, Upper School Head of Visual Arts and Director of Summer Film. As Artistic Director of The Righteous Conversations Project, she brings together Holocaust survivors and teens to produce public service announcements about social injustices. Recently, with Friendship Tours World Travel, she took students to Laos to make documentaries about the Secret War and will travel to Rwanda for the 20th anniversary of the genocide in 2014. (Sue) Thank you to Carol Wells and the Board of the Center for the Study of Political Graphics for honoring us today. We are humbled and grateful. The work of this organization is so very important and we hope you will all continue to support it. Thank you to all of our friends who are here to celebrate with us. Thank you Terry for that wonderful introduction. (Cheri) We asked Terry to introduce us because we share a common core. For us the stereotype of the lone artist struggling in the studio could not be further from reality. Artist and activists flourish in a community and the Woman’s Building was that for us. We feel profoundly lucky to have been born at an historical moment of second wave feminism that gave birth to this place that in turn nurtured our development. (Sue) At the Woman’s Building there was always something activist to do. There were exhibitions and educational programs to organize, and art projects of all kinds to work on with other people. Making art collaboratively was in and of itself a political statement. And it was fun. 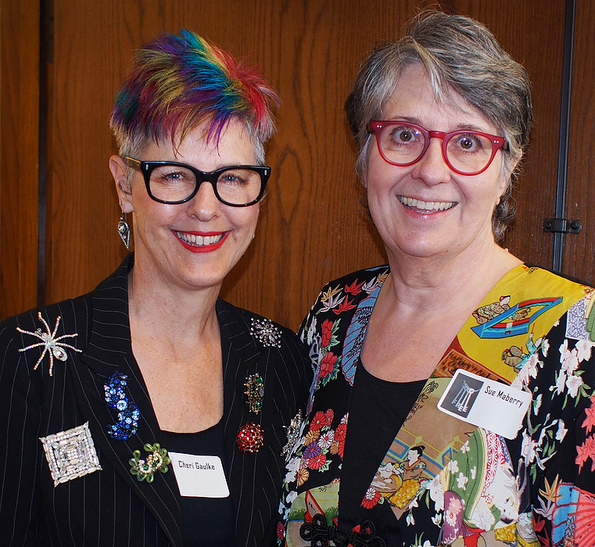 (Cheri) We particularly acknowledge our Woman’s Building mentors: performance artist Suzanne Lacy, designer Sheila de Bretteville, and the late great art historian Arlene Raven. We embraced her definition of the function of feminist art, which applies to all activist art: to raise consciousness, invite dialogue and transform culture. We are grateful that so many organizations, such as CSPG, continue to exist and support activist art. The spirit of the Woman’s Building lives on in our hearts. Its roots are deep. Many of the relationships forged there continue and over the years new and equally strong relationships have grown. That includes many of you here today. A network of new connections continue to spiral out. And it’s pretty great that we found each other there and began a life-long relationship and partnership in all things. (Sue) We have been able to bring what we learned at the Woman’s Building into new settings. We both found supportive organizations where we could continue to be creative, as artists, activists and educators. We are grateful for our positions at Otis College of Art and Design and Harvard-Westlake School. (Cheri) I am also grateful for my collaborations with The Righteous Conversations Project and Friendship Tours World Travel. I would also like to acknowledge my parents who supported me to pursue my passion for art and my mother for introducing me to strong women artists such as Frida Kahlo, Georgia O’Keeffe and Kathe Kollwitz. (Sue) And to our beloved twin daughters Marka and Xochi who couldn’t be here today because they are away at college. They have learned the value of community and have joined us in taking up the hammer. And now to be receiving an award on top of it all! What could be better? So here’s to lots more fun for all of us in the future!